Strong and practical for your specific needs. Strong and stable – even the smallest bench weighs in at 35kg, designed to be very heavy duty, with extra wide arms to help support residents while getting in and out of the chairs. Weatherproof – Winawood is synthetic, it’s a composite material that does not need to be oiled or covered. It is completely maintenance free which will save you time and money in the long run. No storage required – you won’t have to bring this furniture inside during the winter, it can be left outside in the snow and ice without rotting or becoming brittle. This innovative new range of outdoor furniture by Winawood™ has been built to appear like a wooden bench, with a natural grain like effect, but with the strong and durable properties of a modern man made product. It comes complete with a 2 year warranty, so if in the unlikely event your furniture has become damaged, you will have a free replacement sent out immediately. 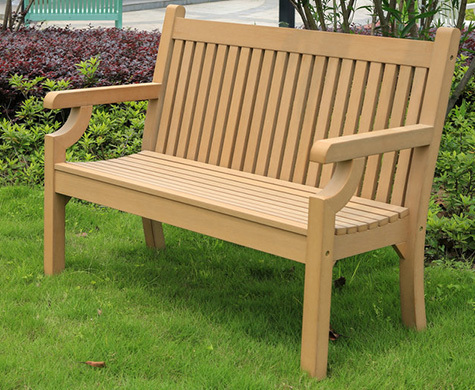 Several people go out of their way to get the best outdoor furniture for care homes. It’s true that you can enjoy being outside more than you normally would without them. With a complete set of furniture in the yard, you can have guests over or just for your family to lounge. In the summer it can be very fun to have barbecue parties, your guests will enjoy it. Outdoor furniture is different than indoor furnishing because they are designed to withstand the weather and are also made easy to clean. You can look at three different types of furniture for your outdoors; there is the wicker or rattan, wooden and aluminium. If you are thinking about getting wicker to go with your Asian, Mediterranean or traditional style there are a few things you should know before you buy them. They can not withstand different weather changes. Water from rain or snow and even the sun can cause this type of furniture to crack. To prevent this from happening you can coat them with a varnish and keep them protected during harsh weather like snow and rain. Wood is also a beautiful option for exterior furniture. This is the most expensive type of outdoor furniture for care homes you will find because wood itself is valuable. We all know that wood and water don’t mix so you will need to be very cautious with taking care and protecting them from damaging. You can begin by sealing it with a water sealer. If you can afford it, then it would be worth looking for the better brand sealants that will also protect from UV rays. Once you have this sort of protection, you will be able to clean wooden furniture with a little water and soap without damage. Having any outdoor furniture is very nice to compliment any home. Whatever kind of furniture you decide to get they all provide the same comfort and need some maintaining and care. You may leave your furniture out all year round, but if you want them to look like new every summer, then it would be better to put them away for the winter. Whether you get wicker, aluminium or wooden furniture why not complete the look with a beautiful outdoor rug. It is essential that we do a regular inspection of our outdoor furniture.We should start preparing for the winter months ahead. Outdoor living spaces have become more popular than ever, and we find an increasing number of homes getting gazebos, pergolas, etc. made. The furniture should be treated to be weather-resistant and well cared for. With a well-kept place, you will be able to enjoy your outdoor living area much better. The most important step is to keep the outdoor area and storage clean and well protected from dirt and moisture. Keep in mind that mould can spread quickly and leave the furniture in bad shape. One can use Soap and water to clean the area and then rinse and let dry. For that difficult stain, make a mixture of ammonia, vinegar, baking soda and water and use a soft brush to work on the stains. Once you have cleaned the area and furniture; give the whole place a protective coating to keep it looking good. Aluminum or plastic pieces can get a coating of wax to protect them. Check wrought iron fence and metal furniture for any signs of rust. It is best to spray metal furniture with a silicone sealant. Follow the latest and vast choices available in outdoor furniture for care homes trends. You will come across furniture covers that are simply great for extra protection and come in a wide range of sizes and weights. You will come across several options to pick from and suit your needs. Get professional customer care as well as useful tips from their experts as to how to keep your outdoor furniture in good condition.